Picked this up last week at Toys 'R Us for $14.99. Great detail, "chromed" plastic claws, and stands 7.5" tall. 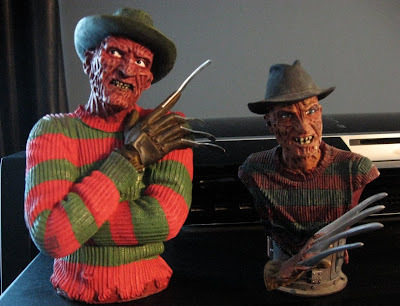 NECA's Freddy mini-bust is on the right for scale. Looks pretty good for a bank, but I wonder why new products are being made using the old Freddy. Don't get me wrong, I only want to see Robert Englund's Freddy. I just think it goes to show which Freddy people really want. You found this at a Toys 'R Us? Too sweet. I feel a shopping spree on the horizon, haha. Yep, they also had NECA Elm Street '10 figures too. only wish i had money to jingle inside of it... very cool! You see the new Jason mask they got out?